This months randomly drawn card is 9 swords. 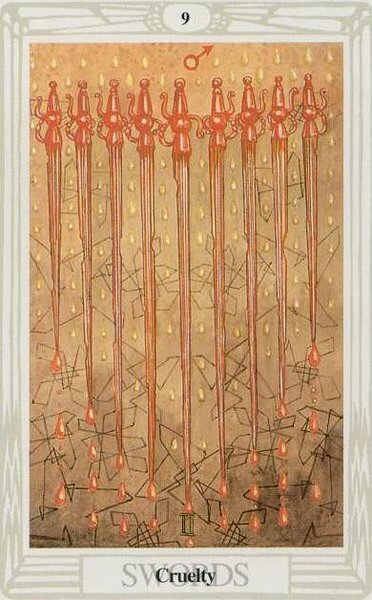 This is one of the harsher cards to see in a reading – at least at first look – with its damaged swords dripping with blood – it is like we have done battle, yet arranged in an orderly fashion it seems the battle has become a habit or pattern. The blood droplets are also mirrored by opalescent droplets higher up and we get the sense of healing energy coming from higher realms to transform and heal wounds. This card is talking about inner pain – in its unaddressed form this inner pain will likely manifest externally for us in the form of someone being verbally (usually) cruel to us, and our experiencing anger and rage over being mistreated in the present day. Astrologically we see Mars in Gemini which can show this rage or passion of mars expressed through thoughts and words of Gemini (and very much swords related), sharp harsh words are had, there may be a feeling of needing revenge and a sense of power over someone. The heart of the matter can be ignored. Eventually though this type of feeling and experience leads us to seek more and to have the courage to go within and explore the inner pain and torture we put ourselves through because of our historical experiences. Healing can then begin as described below. In a reading it may be suggested this cruelty is being experienced externally in some situation – however focusing on the internal side leads to a more final resolution of the problem, and a deeper healing in the client. So in interpretation this card is very much about the cruelty we inflict upon ourselves, repeatedly telling ourselves we are wrong, worthless, useless, and not good enough. The battle was once fought out in the external world, often with one of our primary caregivers, and we were never able to stand up for ourselves enough. We may have decided it was safer to agree with the caregiver and see ourselves as indeed not good enough, and so start to internalise the cruelty, which was often emotional of nature, deep in ourselves. That time may be long over – now however we repeat the pattern of behaviour to ourselves cruelly criticising who we are – our loves, our feelings, our ways of being, in order to feel safe. As adults though we can not make another choice. This card brings the issue to our attention to understand our own ways of being cruel to ourselves. ONce in our consciousness the next step is to begin to change what we say to ourselves. We can use affirmation for this, but often the pattern is so deeply ingrained in order to really allow a new affirmation in we first have to experience the pain of the original wound and emotionally understand we were being treated harshly. ONce we have emotionally felt our own decision to keep ourselves safe in our history it becomes much easier to then change the way we treat ourselves now. Visualising a child part of ourselves can help this process along. Then getting to know, love and listen to this part of ourselves with compassion is a good deal of the way to healing our negative voice. It may be we need to separate out the part of ourselves doing the criticism too, and allow a more open dialogue between the two sides so a renewed trust can be built between the two. We have internalised the perpetrator and though we can not change anyone outside ourselves we can heal and change the internal form, set boundaries for its expression and gain a deep understanding of the underlying motives for the cruelty – which invariably we for protection from some imagined (or even real) threat of some sort in the eyes of the perpetrator. This card brings this powerful healing to our attention – the possibility for it and the timing cue “Now the time is right to address this”. It is often useful in readings to pick an extra card as response to the question: “What will my life look like when I address this issue (or stop treating myself cruelly)?” The card that comes as response to this helps us hold a positive image and outcome rather than pictorially reinforcing our cruelty by holding the 9 swords in our minds. Of course if this second card is also challenging then we repeat this approach with that card, a series of challenging cards suggesting the process of healing is going to take some time and that there are more complex aspects to the underlying pain that need to be addressed to come to full healing. I welcome any comments you may have on these ideas here.